Extra is often an overlooked and hidden gem of a theme. It uses the Divi Builder for its pages and posts, but what makes Extra stand apart from Divi is its Category Builder (which uses it’s own smaller set of modules to create blog index pages). One common user request though is the inclusion of the classic Divi Builder modules within the Extra Category Builder. Enter: the third party plugin by Divi Space, Extra Module Mate. With this plugin the 40+ Divi Builder modules can now be used within the Extra Category Builder to supercharge your Extra theme and the index pages you build with it. In this plugin highlight we’ll take a look at Extra Module Mate and show you a few examples of what can be done with the Category Builder when the Divi Builder modules are added. One of the things that sets Extra apart from Divi is the Category Builder. 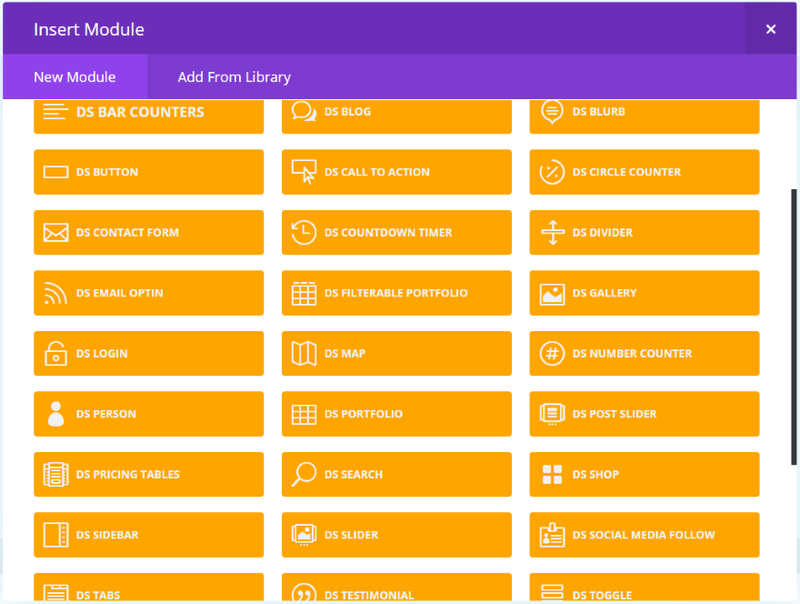 This builder uses its own modules to create magazine or similar modular layouts based on categories. The Category Builder gives you 10 new modules. As you can see the focus is on content, images, text, and ads. You can do a lot with these modules to create interesting layouts. Using a code or text module you can add shortcodes, however modules such as contact forms, accordions, maps, timers, portfolios, comments, galleries, blurbs, call to actions, search, shop, counters, buttons, etc., are not normally available to the Category Builder. This can limit your options for homepage designs. 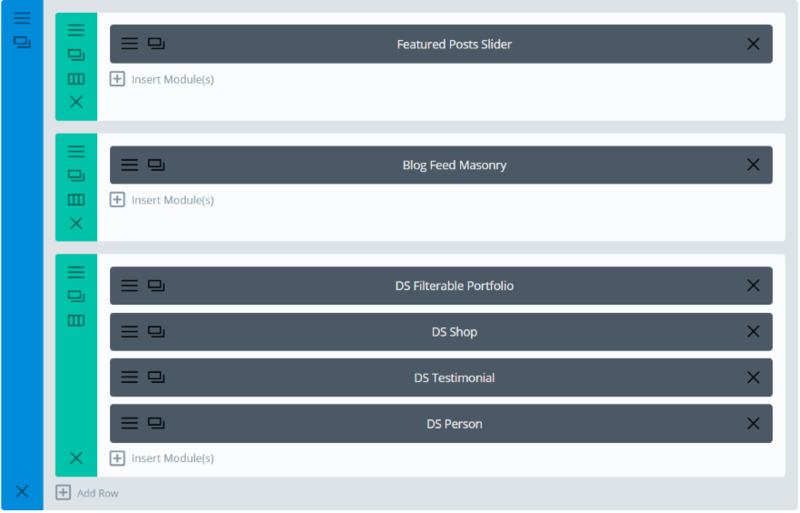 Once Extra Module Mate is uploaded and activated, the Divi Builder modules will be available in the Category Builder. The plugin adds the Divi Builder modules in yellow with the prefix DS. 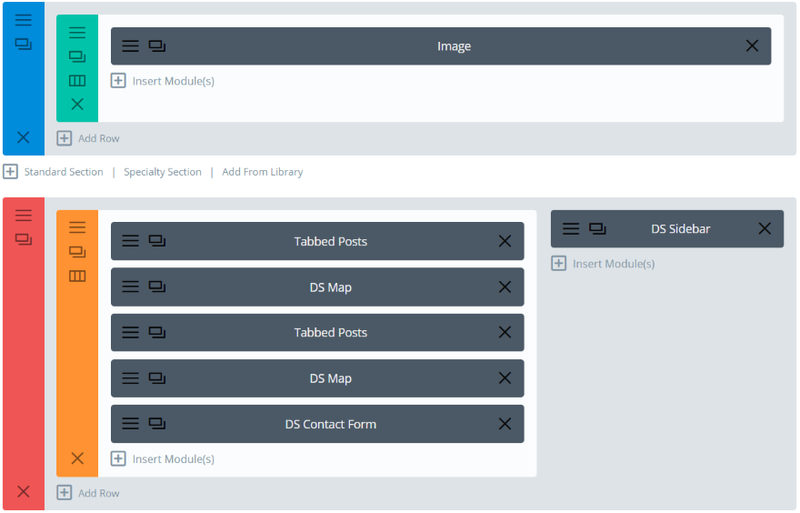 The modules work the same as they do in the Divi Builder including all of their features and settings. You can even make them global to other Category layouts if you want. For this example I loaded the magazine layout in the Category Builder and set it as my homepage layout. I will add my Divi modules to this layout. Here’s a look at the layout using my mockup content. I chose not to use a sidebar and I removed the row of three posts because it was repeated content (without me creating more categories). Since this is a test site with no actual visitors, popular and top rated are the same. In reality, organic traffic will shape your content so you won’t see the same articles multiple times. 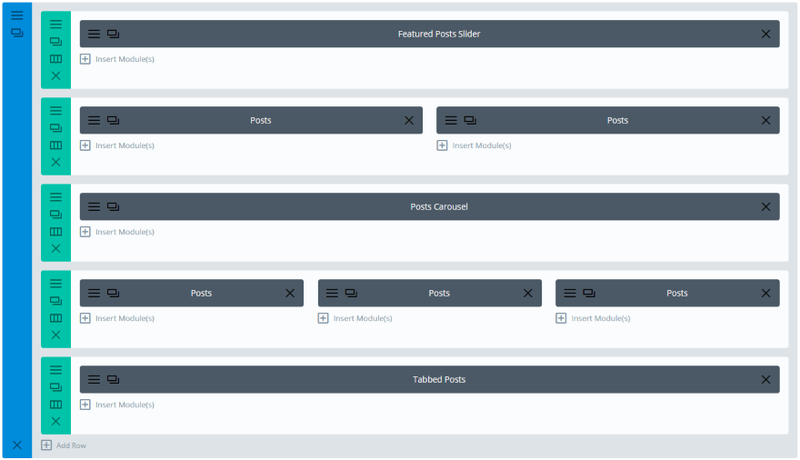 Here’s a look at the layout with the Divi modules I’ve added. The layout now includes Search, Video, Call to Action, and Map modules from the Divi Builder. I styled them to match the homepage layout. 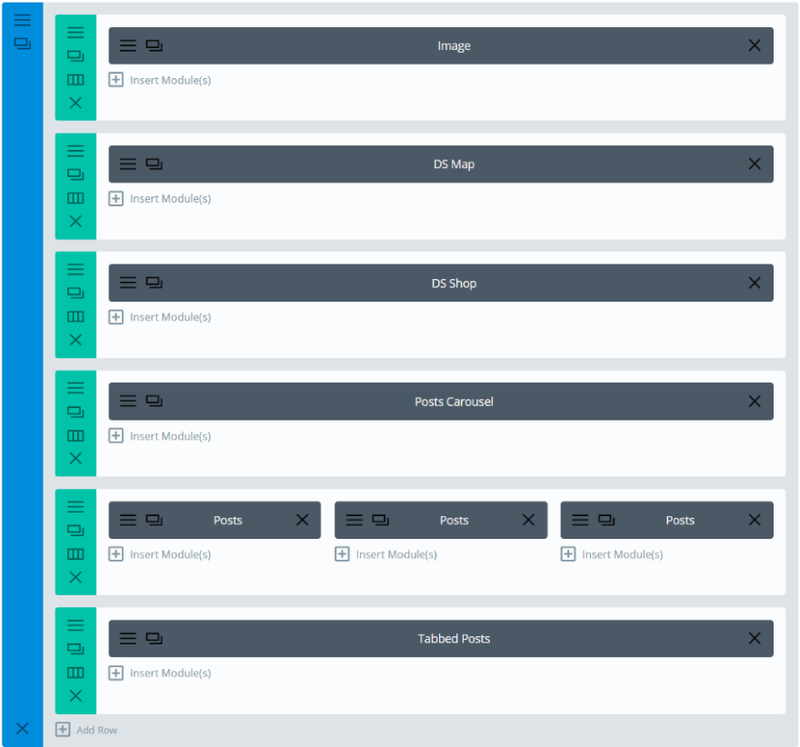 Here’s the layout with the Divi Builder modules. I’ve added the search box just under the post slider, which can be helpful for review sites or sites with lots of content. At the bottom I’ve created a call to action using a video, CTA with image and button, and a map to show the location. This is a great way to place a CTA for an event, subscription, or product on your homepage. Here’s another modification of the pre-made magazine layout. 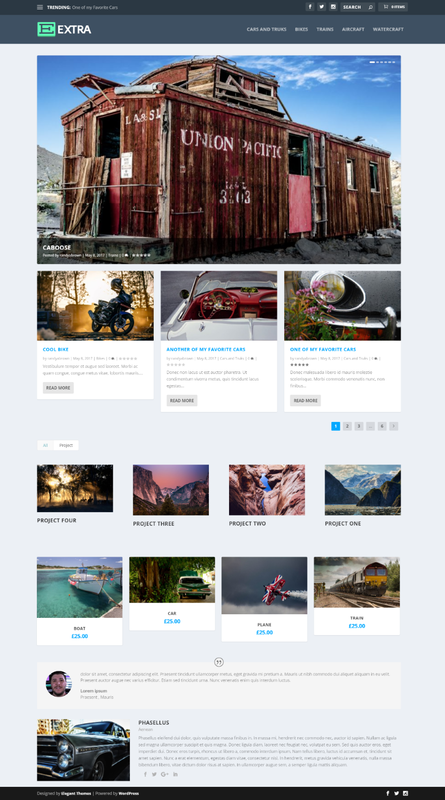 I added a featured image and then added two Divi modules – map and shop. I also removed the two-column post row; this time leaving the three-column post row. As you can see this is just a small change but it makes a major difference to the layout. Only the map and shop are new and they integrate perfectly into the magazine layout. In reality I wouldn’t make it quite so busy but this shows the advantage of adding Divi Builder modules to your Extra Category layouts. For this example I want to create a portfolio with blog, testimonials, and a shop so someone could sell their photographs, art, or similar products. 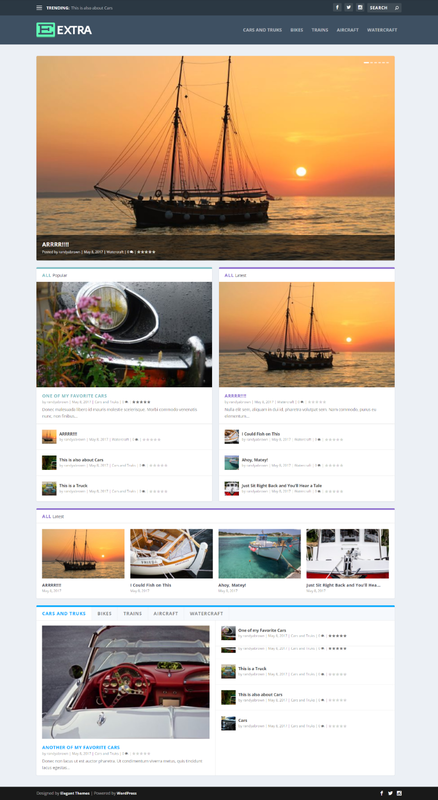 I’m starting with the masonry blog layout with featured posts slider premade layout. Here’s the layout before I make any modifications. It’s a clean three-column blog with a featured post slider. I’m using the slider to display a single featured post. 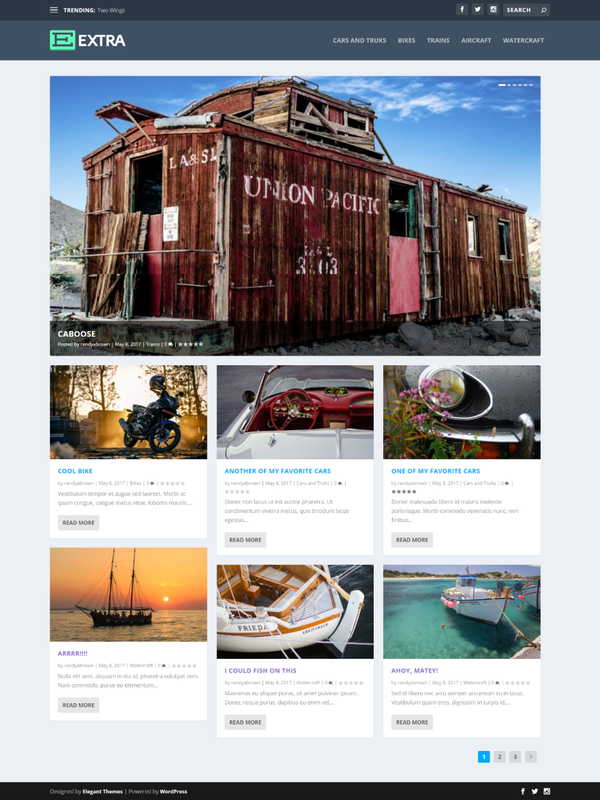 My new layout includes a filterable portfolio, WooCommerce shop, testimonial, and a person module so readers can learn more about the photographer or artist. Here’s how the new elements look within the layout. I’ve reduced the blog post count from 6 to 3 to help keep the layout clean. This can be used to blog about the products, show the products as projects, and provide links to the shop pages where readers can purchase. For this example I built a layout from scratch using an image as a header followed by a specialty section that includes tabbed posts, maps, contact form, and a sidebar. Extra Module Mate works great with specialty sections. The layout includes two sections with tabbed posts and a map followed by contact form. This can be useful for showing events, or anything else that could benefit from showing a location, in tabbed posts and then placing pins for each location on the map that follows it. 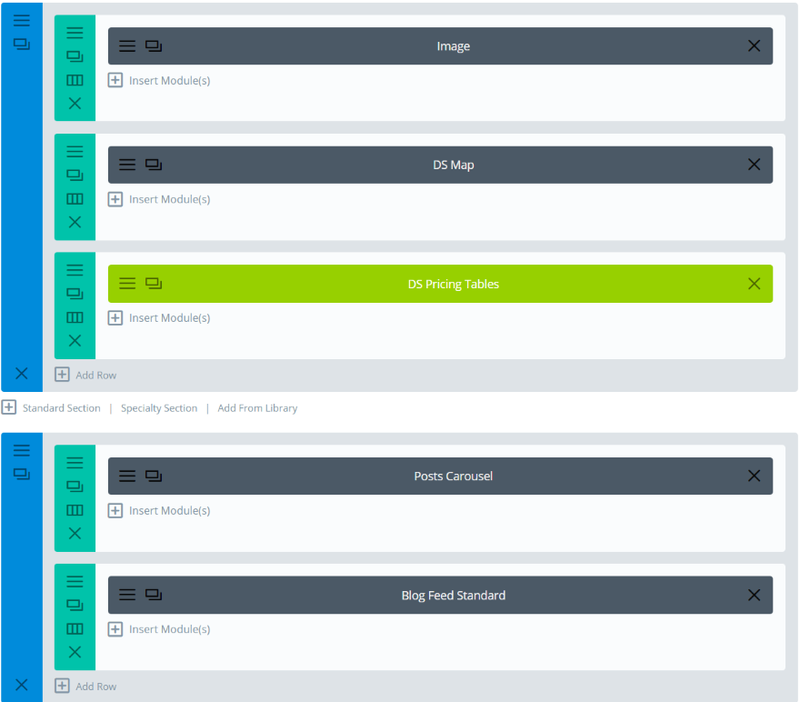 In this example I wanted to create a standard blog and add pricing tables and a map. To take advantage of the Category Builder modules I added a post carousel and standard blog feed so I could use the star ratings. I’ve made the pricing table global so it can be used with other Category layouts if I want to create a new homepage. Here’s my new blog layout with the Divi modules added. This would make an interesting blog for a travel agency. 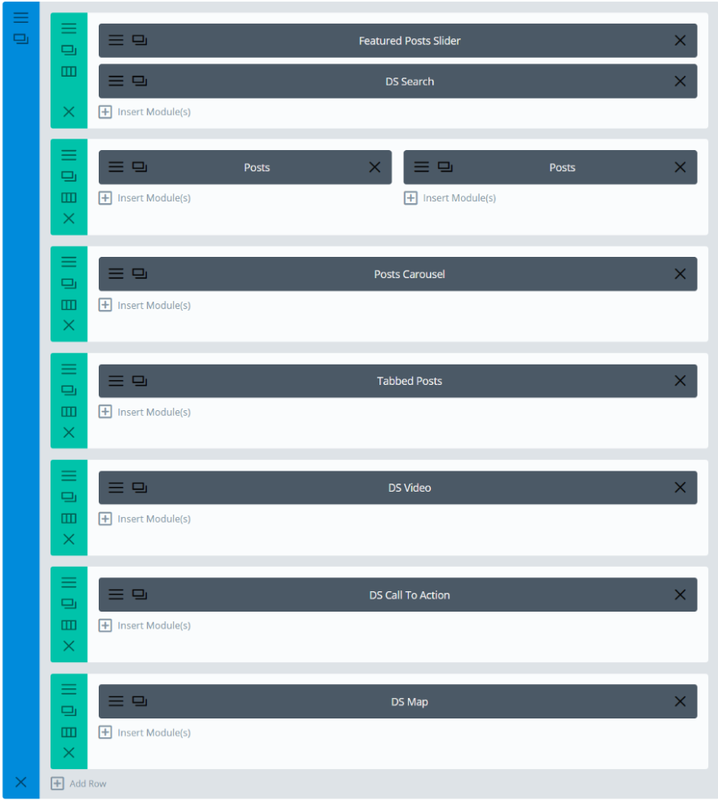 The map and pricing tables (the only Divi Builder modules in this layout) are great for creating CTA’s. Pricing for Extra Module Mate starts at $16 for a single site license. Documentation is provided in the information section of the sales page. Extra’s Category Builder uses its own modules rather than the standard Divi Builder modules to create magazine-style layouts. Although the Category Builder only has 10 modules, they’re enough to create the most popular and common magazine layouts with ease. However, this can be limiting if you want to create a layout that’s more unique. Extra Module Mate adds the standard 40+ Divi Builder modules to the Category Builder, giving those who want to add more to their layouts the Divi modules they need. The layouts I’ve created in these examples would not be possible with the Category Builder modules without using code or shortcodes. Thanks to Extra Module Mate, creating them was as simple as using the Divi Builder. This is just scratching the surface of what can be done with Extra and creating Category layouts with Divi Builder modules. I can imagine lots more possibilities and I’m sure it wouldn’t take long to come up with even better designs than I’ve shown here. Extra Module Mate is easy to use and is essential for anyone wanting to use Divi Builder modules within Extra’s Category Builder. We’d like to hear from you! Have you used Extra Module Mate? Let us know about your experience in the comments below! Nice article – still not understanding, even if wished by a lot of users, why the merge between divi and extra is not on the roadmap of ET? After DIVI 3.1 comes out I can see a Extra 2.0 come out. What new features does it get I do not know, but that theme needs a vital update far beyond just what this plugin brings to the table. Count me in for this. Never understood why there are two separate themes. It is incomprehensible. This should be part of the EXTRA core. I couldn’t agree more! Yes, it should be part of the EXTRA core and not a (payed) third party product. I agree. No more creativity? I’m confused, so I need to buy a plugin which removes a restriction put there by ET? Why not have the modules available for the category builder anyway? Great work, Randy! Those examples on how you used the Extra Module Mate are truly enlightening. If the answer if yes, do you have a tutorial or something to do it, if the is no, what plugin do you use to make that menu? Hello, yes you can create a menu like that. I assume you are referring to the cool Mega Menu. Just go to dashboard > Menus > and select the option to have Mega menu. This works if you have created sub pages or categories with featured images. Hope this helps. FWIW, I’d like to see the ratings / reviews features of Extra added to the Divi Builder. Echoing other commenters: why isn’t this built in? Seems like a no brainier and this plugin proves there’s not some major technical roadblock. I asked for this a long time ago. I think anyone who got excited about Extra assumed this would just be part of it. But nope: the category builder is this strange cousin of the Divi builder and doesn’t share most modules and functionally. Now a 3rd party has done what ET should have from day one. Elegant themes team should implement this by default! It’s a little step for the team, but would be lot useful for users. Extra seems to be a bit limited. Extra is nice, but Divi is most preferable theme as my experience. Nice article. BUT… I’m not in Elegant Themes team, so this is their product, and they make what they want, we still have choice to take or not. So Divi and Extra are both great, thank you so much ! Totally agree. It was a disappointment to see that I could not use those modules. Agreeing with almost everyone here. This should have been part of Extra from the beginning. It makes zero sense to have two builders with different options. I asked on the support forums and was told by a ET support member that “it just doesn’t work that way”. Clearly it does, but it took a 3rd party to turn it on. Come on guys, this should be in Extra’s core, not as a 3rd party add on. As i say a few Years ago, we need for some reasons DIVI and for other reasons EXTRA. But die DIVIEXTRA Theme should be the Killertheme. Go on and merge it together for the Best Theme on the World. Hi Leza, I think there might be some misunderstanding. The “plugin highlight” series of posts is a series we publish to highlight the work of third party developers in our community creating products that are meant to extend Divi and Extra. Neither this plugin, or any of the plugins featured in our plugin highlight series, are created or sold by us. And it’s important to note that if you bought an Elegant Themes membership, you have full access to all of the features and tools promised to you. We are also constantly improving our themes and plugins. At the moment, we’re releasing a new Divi feature update almost every week. Which of course is free to you as a member. Hi Nathan, thanks but it seems you didn’t answer the question. It seems very odd that this wasn’t built into Extra. Likewise the footer editor. Why should I pay for a theme and then have to go to footer.php to edit the footer? Hey Nkechi, it’s true that if you want to edit the layout of the footer you will have to edit the template. However, if you simply want to edit the content (such as the footer credits), that is all possible from within the customizer settings. Also, I have to respectfully disagree with the idea that these types of posts are “trolling our clients”. We’re supporting a developer in our community who has created an extension for our theme. We’re happy they are passionate enough about our products to make complimentary products. And if folks like yourself want that functionality then we would encourage you to pick up a copy of their plugin. Now, that’s not to say that a complimentary service, feature, or function that someone comes out with as a third party may not also be in our development pipeline. We’ve actually talked about adding the builder to the header, footer, all custom post types, and adding more fluidity between the Extra Category Builder and the Divi Builder–and a whole lot more! But we’re often constrained by a few powerful factors. The biggest one being time. We have WAY more good ideas than time to implement them. So we have to prioritize. And sometimes things end up in our development queue while we take care of higher priorities. In those cases it’s not going to be uncommon for a community member to also recognize the need and create an immediate solution in the form of a plugin, child theme, or layout pack. We think this is good for everyone. It builds out the Divi ecosystem, it gets much wanted features into the hands of users faster, and in many cases it provides cool additions that we didn’t think of or don’t have plans to add to Divi ourselves. Our goal, of course, is not to troll. But by constantly improving our products in the best ways we know how and in the order that makes the most sense from our perspective (as well as promoting a third party ecosystem) we hope to empower our community to do more. Great respect for actually posting my comment I didn’t misunderstand at all I am looking at the plugin which is great but I am also thinking I now have to pay extra. My worry is having played around with Divi I don’t feel it is as finished as the beautifully crafted videos say.. achieve pages builder and side bar colours Extra to name two and that third party builders are seeing this and making plugin’s. I am worried that you will look at these plugins and because as you say you only have so much time and priorities these issues will not be addressed as there is already a solution. Therfore going forward not only will I have to pay for a subscription but plugin’s as well. Perhaps I’m missing something, but why can’t much of what is achieved in this article be achieved using Extra as a theme with the Divi Builder plugin to make Divi features available? The Divi Builder plugin is supposed to work with any theme, so why would someone use this 3rd party plugin instead? However you view this article one can only naturally surmise that dedicated members are going to be really, REALLY annoyed with ET. Perhaps ET should simply use some of its cash pile to buy the rights to these plugins in order to distribute them to its members? I find it annoying that after buying a plugin to make what you would think should already be in the theme is added to the theme after that plugin purchase. I find it annoying to have to add another plugin when adding more plugins can cause more issues and blot for something that you would think should already be in the theme. Great article, bought the plug-in yesterday. Does that also mean we can export/import modules and settings across themes e.g. from Extra to Divi? — Yes, and do you know why ? Because of this disconnect between Divi Builder and Category Builder. I run a magazine, and extra is by far the theme for me. This plugin is exactly what I needed. Hope someday to have this functionality built in but for now, this is an affordable and awesome solution. Thanks so much! I admit I was taken aback when I could not use the Divi Builder nor use preview in the category Builder. And if you make multiple themes for people it’s just one more plugin you have to go buy and bloat the site with. However, I still love Extra. I hope the community will make layout packs for categories once ET integrates this plugin into its core. Then Extra will become as popular as Divi, I believe that. That’s ET for your great blog, video series, and support for third party problem-solvers. I have had more problems with this plugin than I can to document. I am using Extra with no theme. If I try to add the DS Slider, it pulls up the window that says Add New Slide, but you can’t. If I try to add to the Tabbed Posts, it just times out. I absolutely agree with other readers that this SHOULD BE core to Extra without another plugin.